I have not had time to do any Christmas shopping lately with all the choir practices I need to go to and the Christmas events over the weekends and so I went with my son to Sunway Pyramid after work yesterday to get some stuff I needed. And since I have not brought my son for dinner of his choice in quite awhile, I let him decide. We ended up in TGIF. 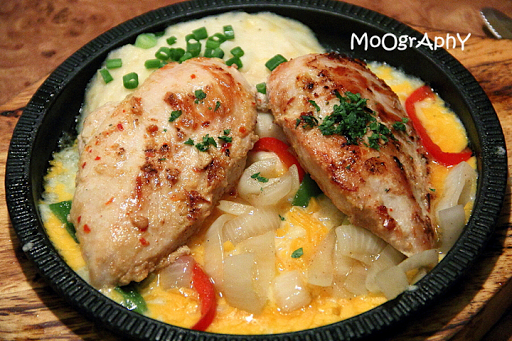 I don't really like the food there but thought the Sizzling Chicken and Cheese would be nice. After ordering it, I wanted to log it into my calorie-counting app and lo and behold, it says that the meal is a horrendous 1150 calories! I was like, are you kidding me. It is 50 calories shy of my daily quota. I decided to just consume half and had the balance packed for takeaway. I cannot imagine the times I was there in TGIF consuming all its high calorie content meals. Don't think I'm ever going to eat there again.